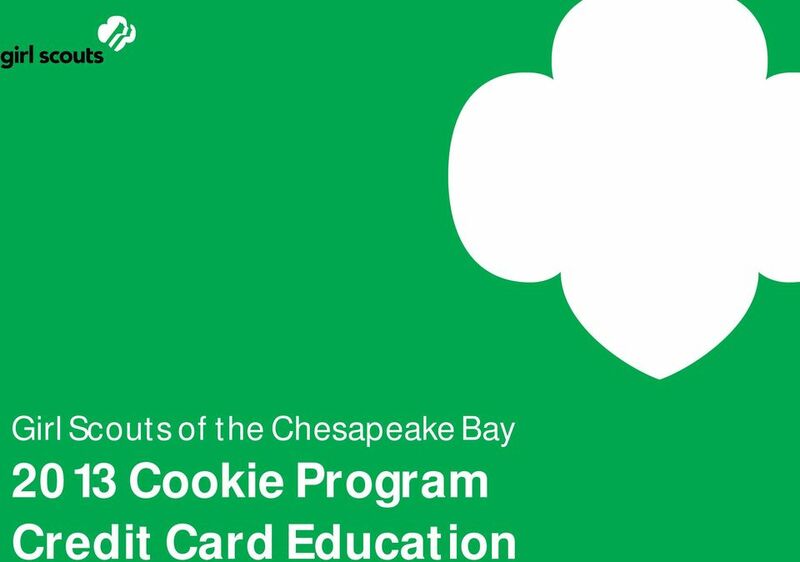 Download "Girl Scouts of the Chesapeake Bay. 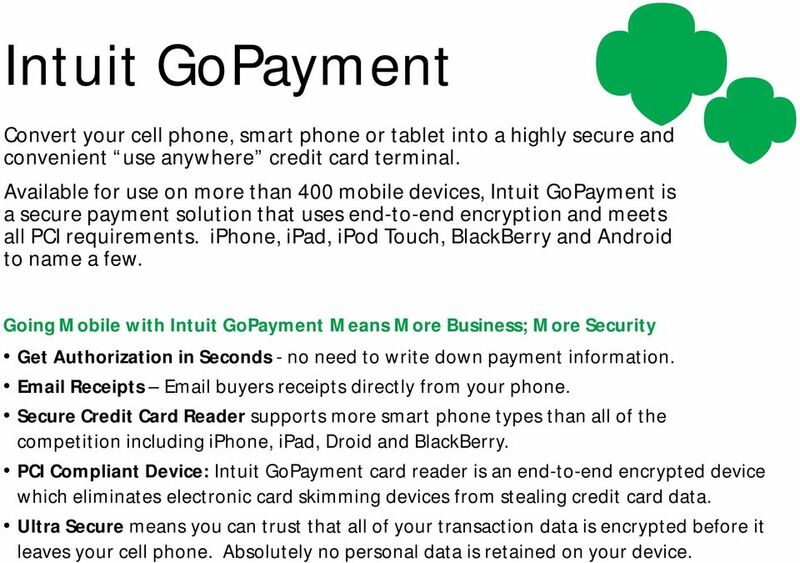 2013 Cookie Program Credit Card Education"
2 Intuit GoPayment Convert your cell phone, smart phone or tablet into a highly secure and convenient use anywhere credit card terminal. Available for use on more than 400 mobile devices, Intuit GoPayment is a secure payment solution that uses end-to-end encryption and meets all PCI requirements. iphone, ipad, ipod Touch, BlackBerry and Android to name a few. Going Mobile with Intuit GoPayment Means More Business; More Security Get Authorization in Seconds - no need to write down payment information. Receipts buyers receipts directly from your phone. Secure Credit Card Reader supports more smart phone types than all of the competition including iphone, ipad, Droid and BlackBerry. PCI Compliant Device: Intuit GoPayment card reader is an end-to-end encrypted device which eliminates electronic card skimming devices from stealing credit card data. Ultra Secure means you can trust that all of your transaction data is encrypted before it leaves your cell phone. Absolutely no personal data is retained on your device. 3 Requirements to use GoPayment 1. 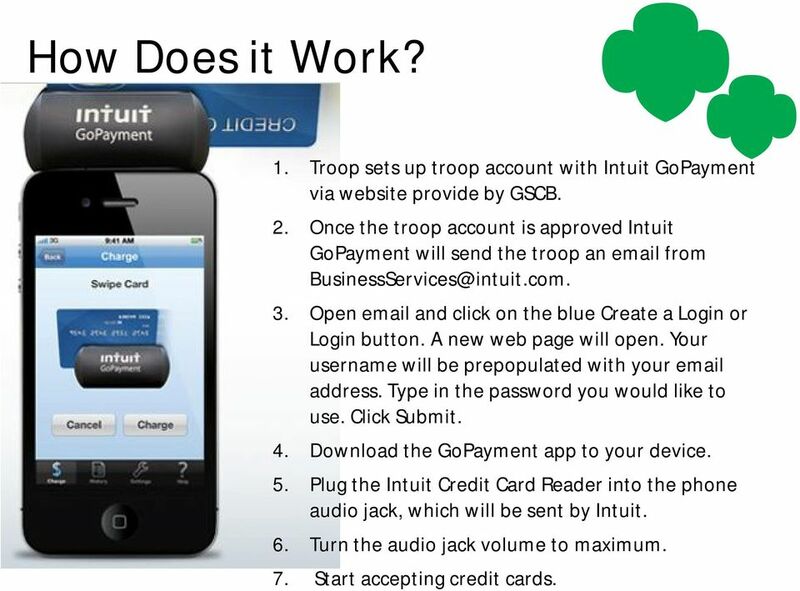 Intuit GoPayment Mobile Payments Account GSCB will send the troop the account set up information after a registered troop adult takes the required training and quiz and submits the Application to Participate in the GSCB Mobile Payment Processing Program form. 2. 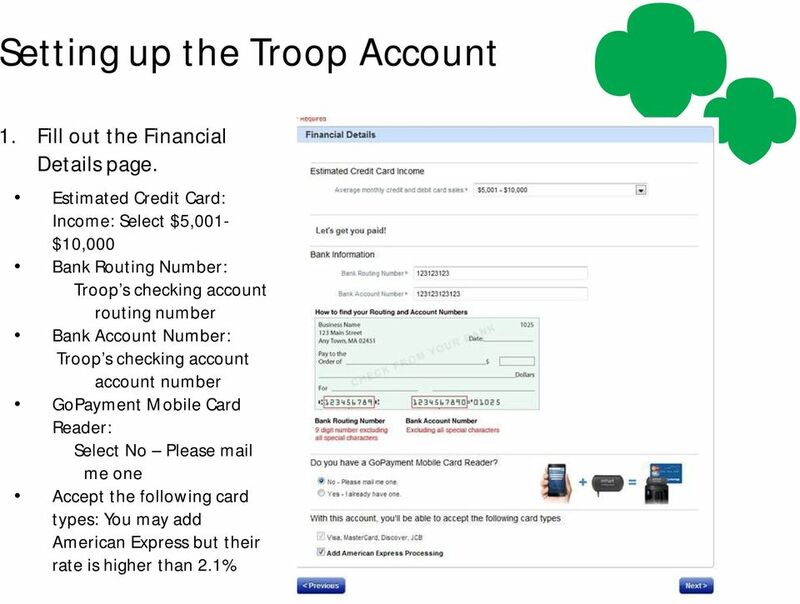 Valid troop checking account. 3. Compatible mobile phone or tablet. Download the GoPayment app available in the itunes app store and Android Marketplace. 4. Data plan for your mobile device. 5. Credit Card Reader Swiper - Provided to you by Intuit GoPayment after your account has been set up. 5 How Does it Work? 1. 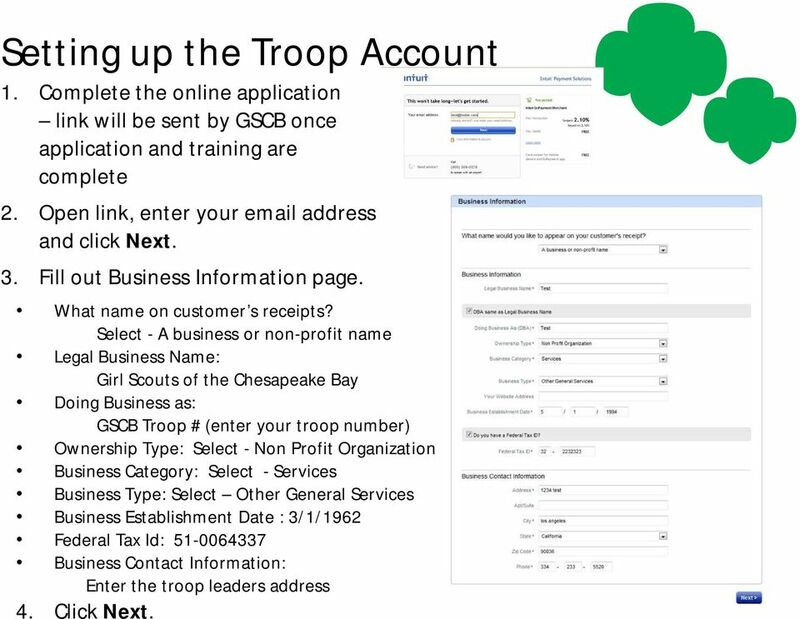 Troop sets up troop account with Intuit GoPayment via website provide by GSCB. 2. 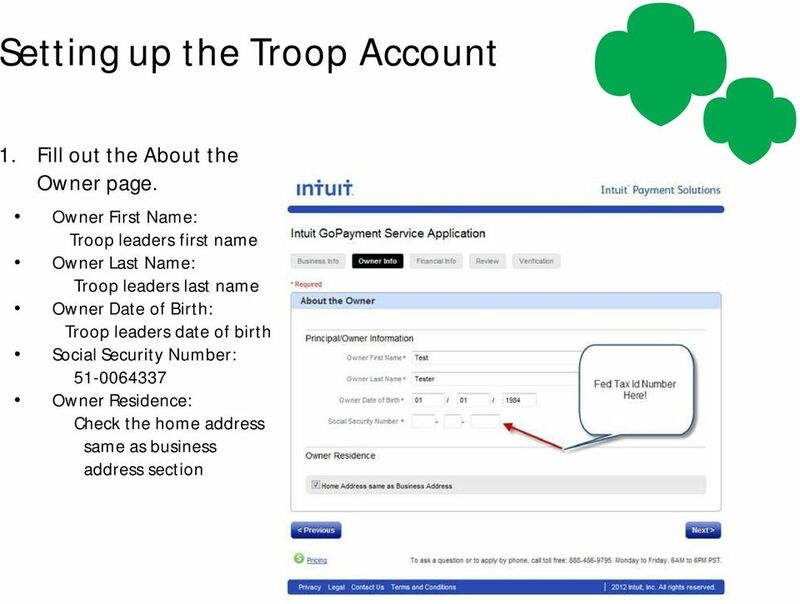 Once the troop account is approved Intuit GoPayment will send the troop an from 3. Open and click on the blue Create a Login or Login button. A new web page will open. Your username will be prepopulated with your address. Type in the password you would like to use. Click Submit. 4. Download the GoPayment app to your device. 5. Plug the Intuit Credit Card Reader into the phone audio jack, which will be sent by Intuit. 6. Turn the audio jack volume to maximum. 7. Start accepting credit cards. 6 Setting up the Troop Account 1. Complete the online application link will be sent by GSCB once application and training are complete 2. Open link, enter your address and click Next. 3. Fill out Business Information page. What name on customer s receipts? Select - A business or non-profit name Legal Business Name: Girl Scouts of the Chesapeake Bay Doing Business as: GSCB Troop # (enter your troop number) Ownership Type: Select - Non Profit Organization Business Category: Select - Services Business Type: Select Other General Services Business Establishment Date : 3/1/1962 Federal Tax Id: Business Contact Information: Enter the troop leaders address 4. Click Next. 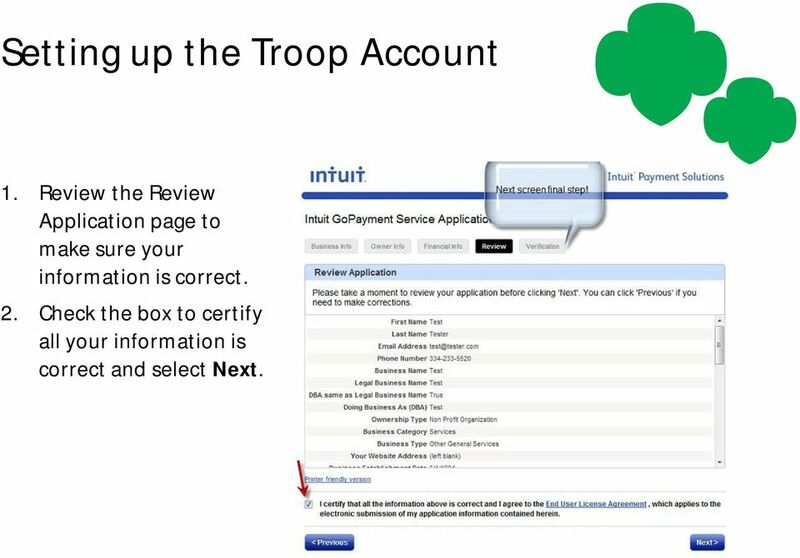 9 Setting up the Troop Account 1. Review the Review Application page to make sure your information is correct. 2. Check the box to certify all your information is correct and select Next. 11 Creating an Item Use the Items feature to store a price list of products. With Items, you start transactions by selecting the items desired for purchase. 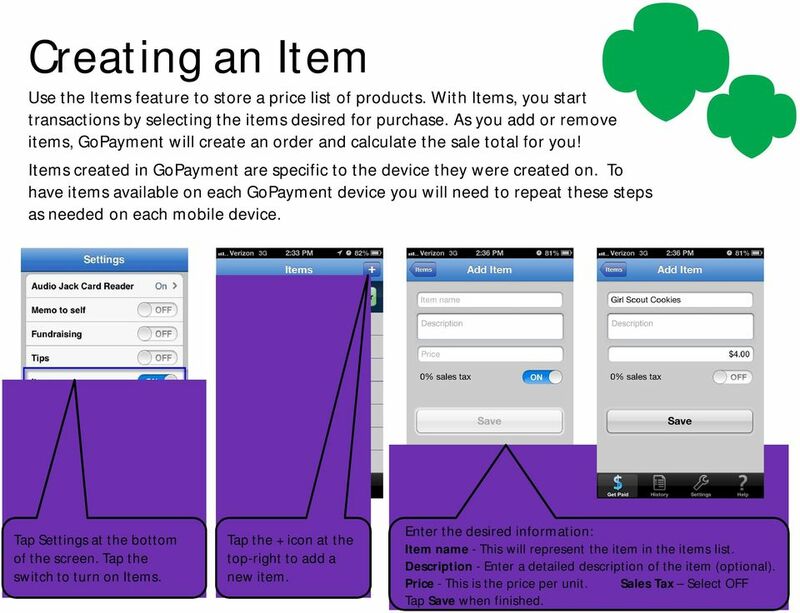 As you add or remove items, GoPayment will create an order and calculate the sale total for you! 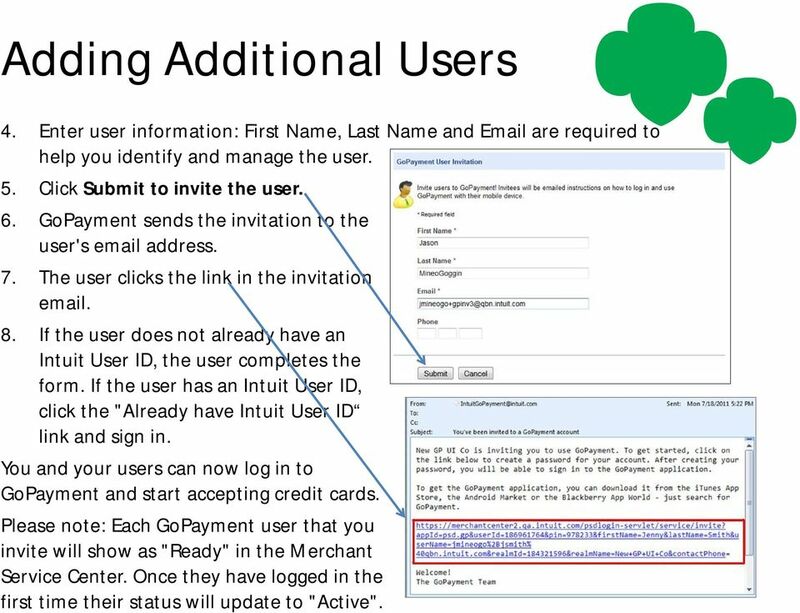 Items created in GoPayment are specific to the device they were created on. 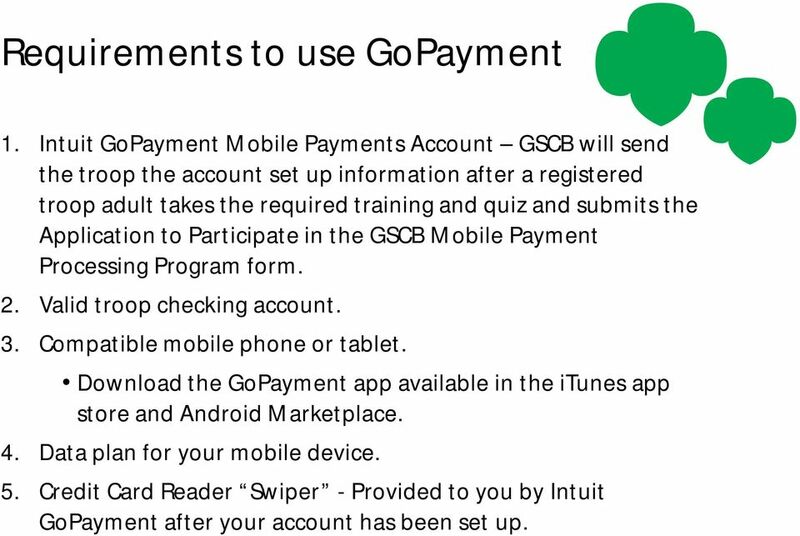 To have items available on each GoPayment device you will need to repeat these steps as needed on each mobile device. Tap Settings at the bottom of the screen. Tap the switch to turn on Items. Tap the + icon at the top-right to add a new item. Enter the desired information: Item name - This will represent the item in the items list. Description - Enter a detailed description of the item (optional). Price - This is the price per unit. Sales Tax Select OFF Tap Save when finished. 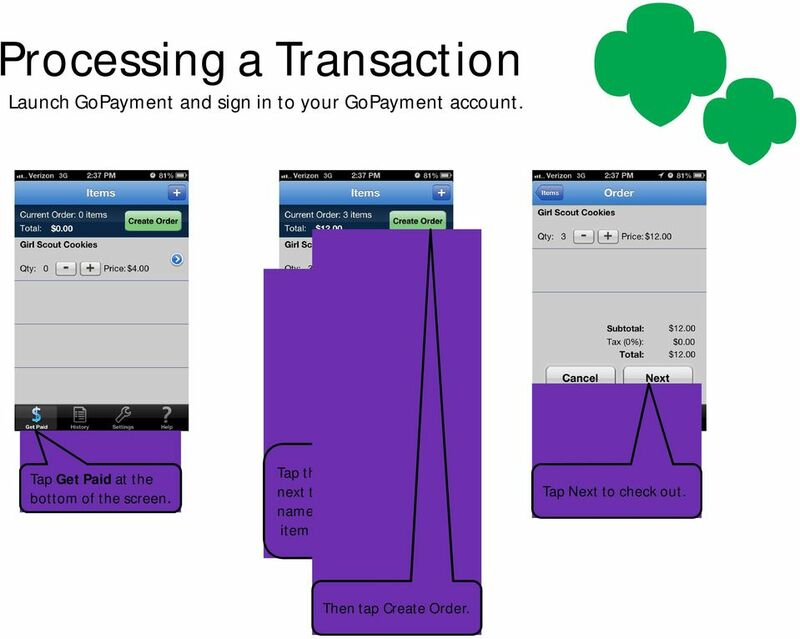 12 Processing a Transaction Launch GoPayment and sign in to your GoPayment account. Tap Get Paid at the bottom of the screen. Tap the + button next to the item name to add the item to the order. Tap Next to check out. Then tap Create Order. 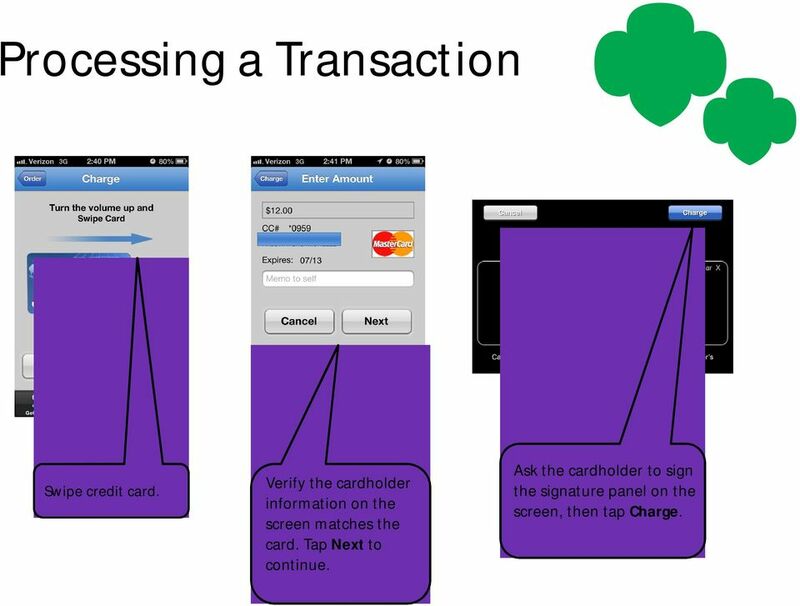 13 Processing a Transaction Swipe credit card. Verify the cardholder information on the screen matches the card. Tap Next to continue. Ask the cardholder to sign the signature panel on the screen, then tap Charge. 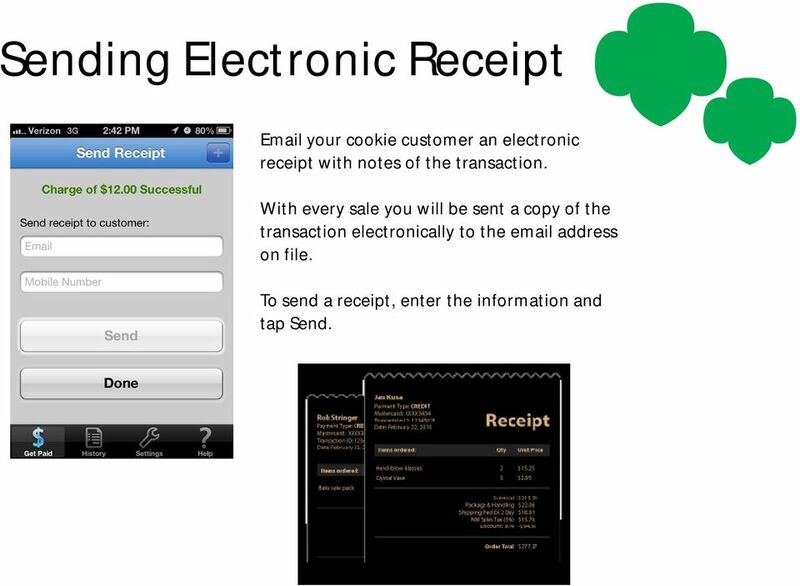 14 Sending Electronic Receipt your cookie customer an electronic receipt with notes of the transaction. With every sale you will be sent a copy of the transaction electronically to the address on file. To send a receipt, enter the information and tap Send. 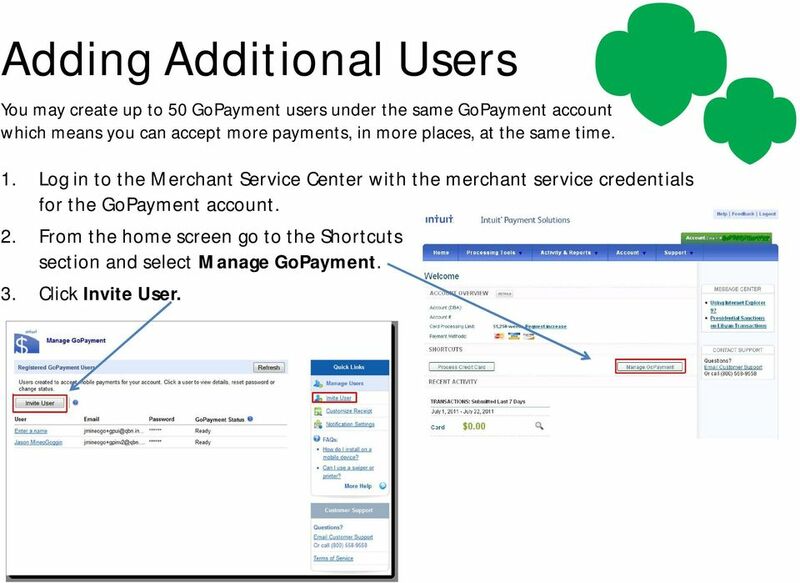 15 Adding Additional Users You may create up to 50 GoPayment users under the same GoPayment account which means you can accept more payments, in more places, at the same time. 1. Log in to the Merchant Service Center with the merchant service credentials for the GoPayment account. 2. From the home screen go to the Shortcuts section and select Manage GoPayment. 3. Click Invite User. 16 Adding Additional Users 4. Enter user information: First Name, Last Name and are required to help you identify and manage the user. 5. Click Submit to invite the user. 6. GoPayment sends the invitation to the user's address. 7. The user clicks the link in the invitation If the user does not already have an Intuit User ID, the user completes the form. If the user has an Intuit User ID, click the "Already have Intuit User ID link and sign in. You and your users can now log in to GoPayment and start accepting credit cards. Please note: Each GoPayment user that you invite will show as "Ready" in the Merchant Service Center. Once they have logged in the first time their status will update to "Active". 17 Search and View Transactions 1. Sign in to the Merchant Service Center. 2. 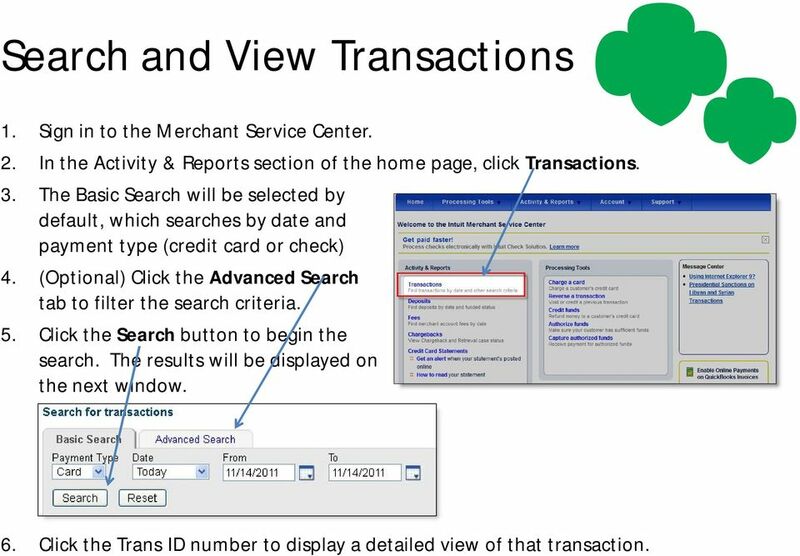 In the Activity & Reports section of the home page, click Transactions. 3. The Basic Search will be selected by default, which searches by date and payment type (credit card or check) 4. (Optional) Click the Advanced Search tab to filter the search criteria. 5. Click the Search button to begin the search. The results will be displayed on the next window. 6. Click the Trans ID number to display a detailed view of that transaction. 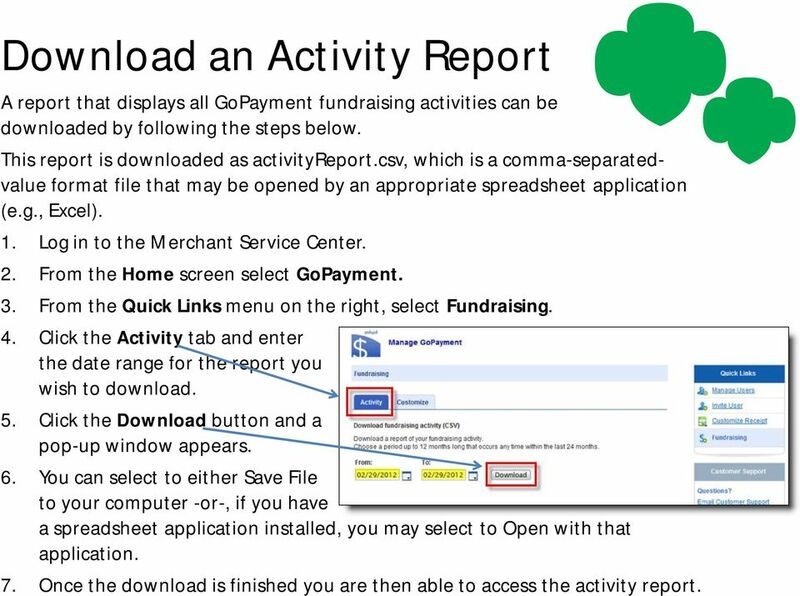 18 Download an Activity Report A report that displays all GoPayment fundraising activities can be downloaded by following the steps below. This report is downloaded as activityreport.csv, which is a comma-separatedvalue format file that may be opened by an appropriate spreadsheet application (e.g., Excel). 1. Log in to the Merchant Service Center. 2. From the Home screen select GoPayment. 3. From the Quick Links menu on the right, select Fundraising. 4. Click the Activity tab and enter the date range for the report you wish to download. 5. Click the Download button and a pop-up window appears. 6. You can select to either Save File to your computer -or-, if you have a spreadsheet application installed, you may select to Open with that application. 7. 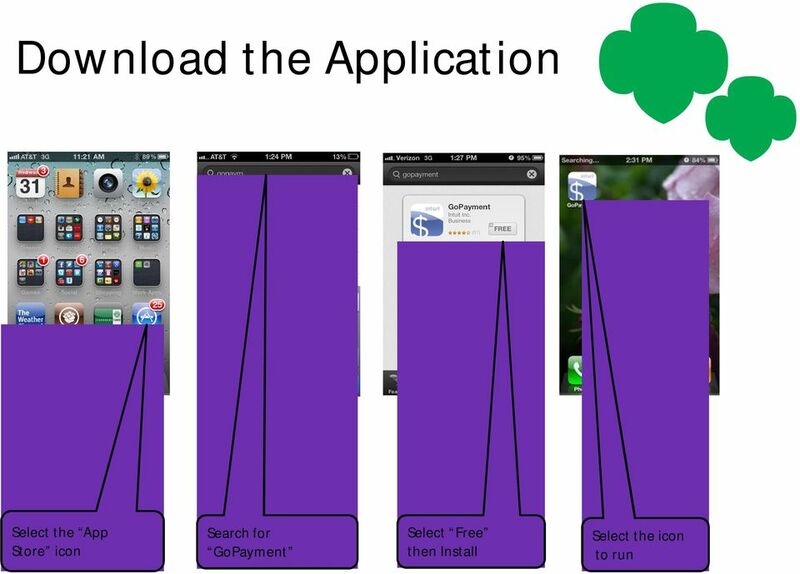 Once the download is finished you are then able to access the activity report. 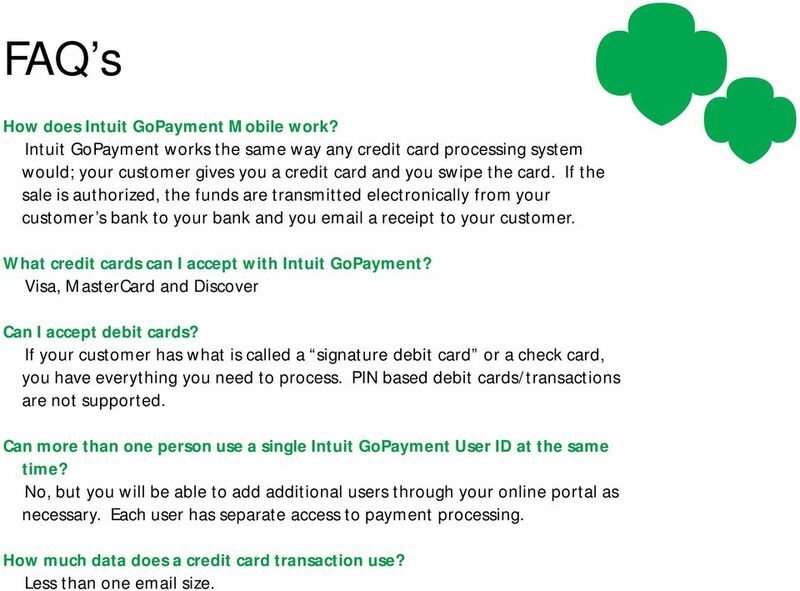 19 FAQ s How does Intuit GoPayment Mobile work? Intuit GoPayment works the same way any credit card processing system would; your customer gives you a credit card and you swipe the card. If the sale is authorized, the funds are transmitted electronically from your customer s bank to your bank and you a receipt to your customer. What credit cards can I accept with Intuit GoPayment? Visa, MasterCard and Discover Can I accept debit cards? If your customer has what is called a signature debit card or a check card, you have everything you need to process. PIN based debit cards/transactions are not supported. Can more than one person use a single Intuit GoPayment User ID at the same time? No, but you will be able to add additional users through your online portal as necessary. Each user has separate access to payment processing. How much data does a credit card transaction use? Less than one size. 20 FAQ s How does my troop get credit? 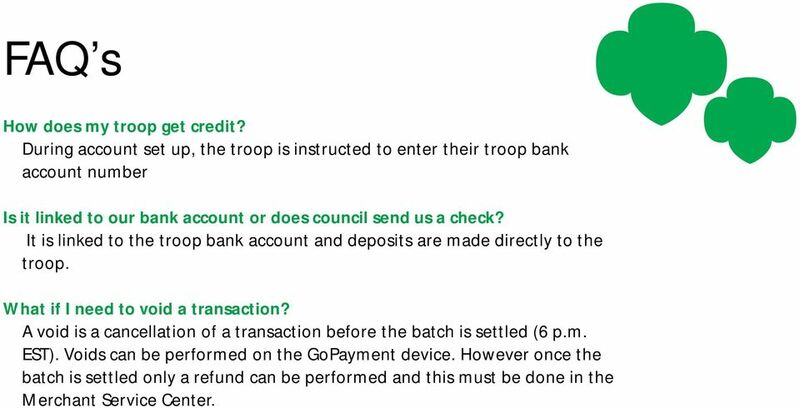 During account set up, the troop is instructed to enter their troop bank account number Is it linked to our bank account or does council send us a check? 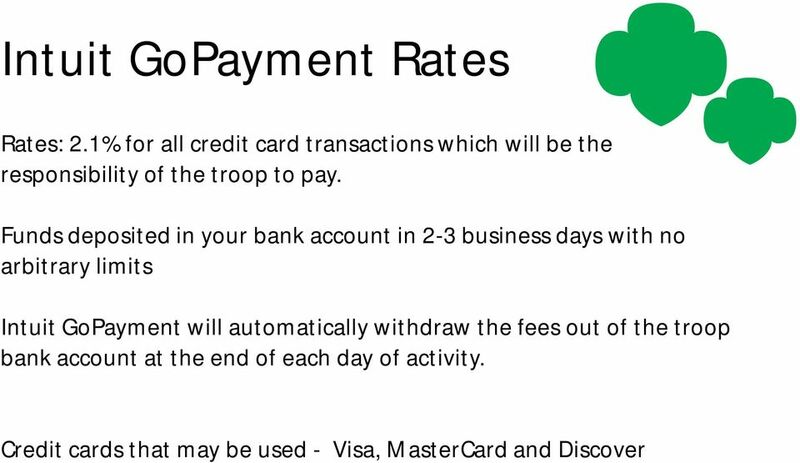 It is linked to the troop bank account and deposits are made directly to the troop. What if I need to void a transaction? A void is a cancellation of a transaction before the batch is settled (6 p.m. EST). Voids can be performed on the GoPayment device. However once the batch is settled only a refund can be performed and this must be done in the Merchant Service Center. Treasurer Report For 8/22/15 Board Meeting Banking Balances on all Art Alliance of Idyllwild BBVA accounts as of August 20, 2015 are as follows. P&L summary from QuickBooks for 2015 is available upon request.